Simple and quick application to open or closed systems via a radiator feed valve or filling loop. Ideal in situations where conventional liquid products are difficult to administer. 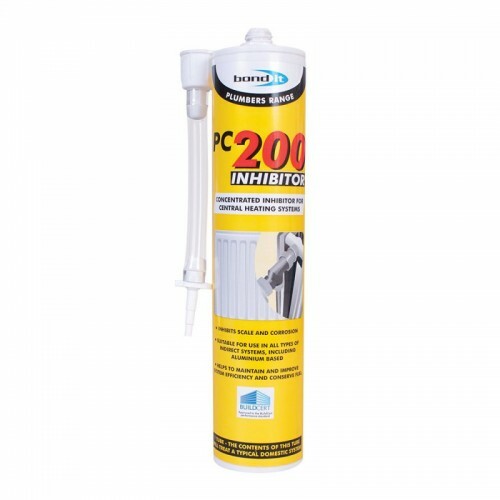 1 tube will treat a typical heating system containing 100L system water. No need to bleed radiators before injecting. Time and cost effective system. Filling the system: Release the pressure then isolate a convenient radiator. Remove the air bleed screw and connect the PC200 plastic adaptor in place of the bleed screw. Place the PC200 cartridge in a sealant gun and holding the cartridge upright cut off the tip of the cartridge with a sharp knife. Connect the cartridge to the adaptor, open one of the isolation valves on the radiator and slowly inject the inhibitor into the radiator. When the cartridge is empty re-isolate the radiator. Remove the adaptor and replace the air bleed screw. Open the valves and repressurise the system. Dosage: For maximum performance PC200 should be dosed @ 0.3% i.e. 1 cartridge per 100L of water. Generally 1 cartridge contains enough concentrate for a typical system with a 14.5Kw Boiler (50,000 Btu/hr) domestic hotwater tank and up to 10 radiators. Larger systems will require more pro rata. Overdosing will not cause any problems or detrimental affects to the system.